Awaken Love, friends and partners of the Gideons work closely with widows and widowers in the rural villages of Western Kenya. Since 2007 we have helped many women get back on their feet and provide for their family again through setting up small businesses; selling food at the local market and tailoring business. We have had many ups and our fair share of down times. We have many stories to share about the lives of widows and their children and some do not always turn out good. The Gideons Ministry recently lost a dear friend of ours to HIV/AIDS and he was only 12 years old. Awaken Love built his mother a house in rememberance of him. If you would like to help rebuild someones house today then there are many people who need this. 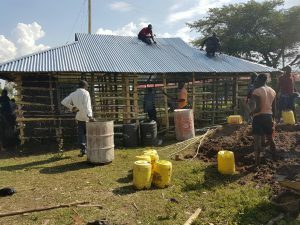 For £600 you can build a strong mud house for an old lady today and help give them a better quality of life.